Home Biafra News Ebonyi Is Part Of Biafraland, Nnamdi Kanu Proves David Umahi (Ebonyi State Governor) Wrong. Ebonyi Is Part Of Biafraland, Nnamdi Kanu Proves David Umahi (Ebonyi State Governor) Wrong. As Dave Umahi sent a message to him not to come to Ebonyi state, he dared Dave Umahi and storm Ebonyi state and pulled out over seven million Biafrans on the street who were shouting Biafra songs in support of our great leader. As David Umahi the Governor of Ebonyi state could not handle his shame and frustration in anger sent the zoo military to block Mazi Nnamdi Kanu the leader of Indigenous people of Biafra (IPOB) and asked him to turn back. He (Nnamdi Kanu) came down from his car walked towards zoo military and ordered them to remove their vehicle from our way, which they immediately without hesitation did and all Biafrans moved with him. This great leader is not like what the zoo has seen before. Honestly, he truly led us to pass the zoo army today just as Moses led the people of Israel to cross the red sea. We all walked pass them without any ounce of fear in any of us. IPOB led by Mazi Nnamdi Kanu is not like Uwazuruike touts who were scavenging for food by kidnapping our fellow Biafrans. We're exceptional. The zoo would have fallen today if they had shot a single bullet at IPOB. 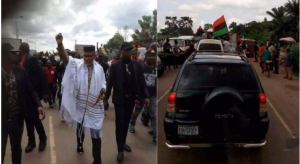 The leader of the Indigenous People of Biafra (IPOB) Nnamdi Kanu finally arrived Ebonyi State where the Governor, Dave Umahi excluded as part of proposed Biafra republic. Recall that the IPOB leader said that the essence of his impromptu visit to Ebonyi is to prove to the Governor that people of his state are all in support of the agitation. However, just as Kanu predicted, the number of people that trooped out to see him are really numerous. Ohaneze, Arewa youths, Eastern governors, and anti-Biafrans calling a person that can control millions or even billions a "small boy". Anyway, let's just say a "small boy" with big God (Chukwu-okike-abiama). Because soonest all the anti-Biafrans will bow to his feet and say "we are sorry".